A Mystic Wedding Photographer is able to take gorgeous pictures of couples with the scenery of the seaport in the background. Mystic Seaport is home to the leading maritime museum in America, with a number of historic sail boats and other watercraft. A Mystic Wedding Photographer is surrounded by beauty, but he also must be sure to capture the moments that make each individual wedding special on its own. 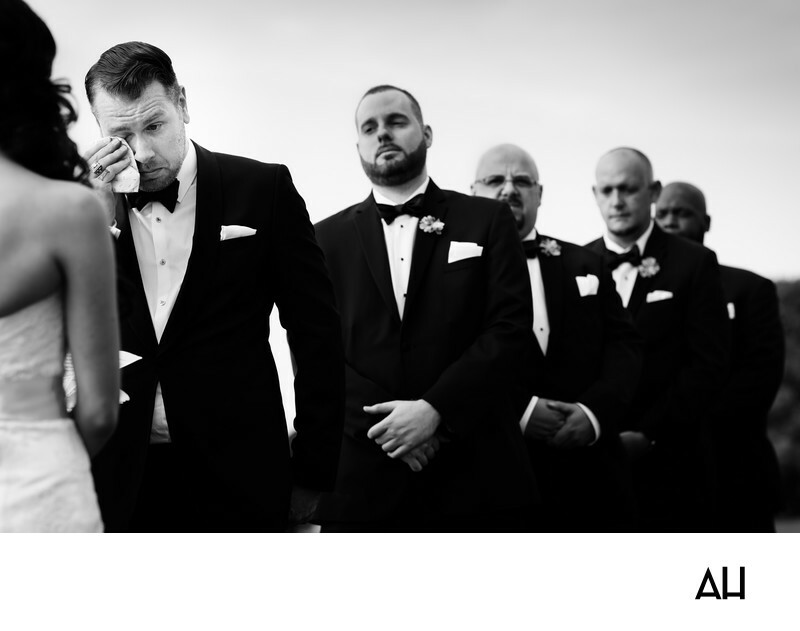 This picture does just that, bringing focus to the bride, groom, and bridal party as they say their vows. The groom and his groomsmen stand in a line before the bride, each dashing in classic black suits, white dress shirts, and black bow ties. The bride has her back turned to the camera, her eyes only for the groom in this moment. The image is black and white, ensuring that attention is not taken away from the people and emotions pictured. The ceremony is taking place outside on the waterfront, but the only indication of this in the photo is the wide open sky above the ceremony. The intention behind capturing this picture was to get the reaction of the groom during the portion of the marriage ceremony that involves speaking vows. The photo is an endearing one, showcasing the bride as she reads her handwritten vows to the groom. The groom pulls out a white handkerchief as she reads and he listens, dabbing his eyes. The words of the bride touch his heart and warm his soul, reminding the groom of how lucky he his to have this incredible woman standing before him, ready to be his wife.